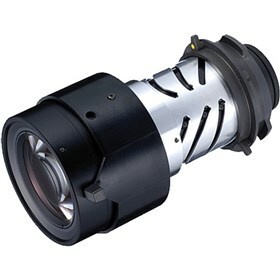 The NEC NP14ZL is a 2.97-4.79:1 zoom lens which is designed for the NP-PA600X, NP-PA500X, NP-PA550W, NP-PA500U, NP-PA500X-13ZL, NP-PA500U-13ZL, NP-PA550W-13ZL, and NP-PA600X-13ZL projectors. Installation of lens can be done easily by end users and it doesn't require any special tools. The NEC NP14ZL has many exciting features for users of all types. You can extend the lifetime of your NEC NP14ZL with the purchase of a FactoryOutletStore Factory Protection Plan. The NEC NP14ZL is sold as a Brand New Unopened Item.